After a career of reading from syllabi and writing about canonical books, the author of The Year of Reading Proust decided to read like an explorer. Casting herself into the untracked wilderness of the New York Society Library, Phyllis Rose chose a shelf of fiction almost at random (author names alphabetized from Leq to Les) and read her way through it. Unsure of what she would find, she was nonetheless certain "that no one in the history of the world had read exactly this series of novels." What results is a spirited experiment in "Off-Road or Extreme Reading," as she dubs it. 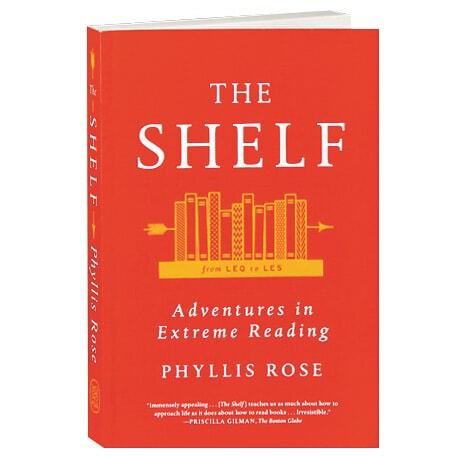 Rose's shelf of roughly 30 books has all the variety of ambition and style she could wish for. The 19th-century Russian classic A Hero of Our Time by Mikhail Lermontov is spine by spine with The Phantom of the Opera by Gaston Leroux. Stories of French Canadian farmers sit beside tales about aristocratic Austrians, and California detective novels abut a novel from an Afrikaans writer who fascinates Rose to the extent that she tracks down a video recording of his funeral. A joyous testament to the thrill of engagement with books high and low, The Shelf suggests that there are treasures to be found on every library or bookstore shelf. As Rose investigates her finds and measures them against her own inner shelf—those texts that accompany her through life—she creates an original and generous portrait of the literary enterprise.